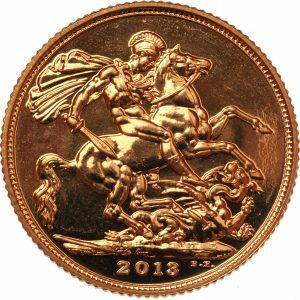 Uncirculated bullion grade 2011 half gold Sovereign. Price includes insured shipping. 2% discount on purchases using BACS. A single uncirculated, bullion grade 2011 half gold sovereign, featuring the fourth portrait of Her Majesty, Queen Elizabeth II by Ian Rank-Broadley. The reverse side features Benedetto Pistrucci‘s design of St. George and the Dragon.